I had never seen The Best Years of Our Lives and didn’t know what to expect. I assumed a film released post-World War II might have a war related theme and I was correct. The strength of the story and its subject matter is relevant not only for WWII veterans but also for returning veterans from every war or military conflict. The film traces the lives of three returning veterans from different branches of the service who meet for the first time on a flight home from Europe. We meet Fred Derry, an officer played by Dana Andrews, who returns to a job as a soda jerk; Al Stephenson, a sergeant played by Fredric March who returns to his job as a bank executive; and Homer Parrish, an enlisted soldier who lost both of his hands in battle, played by disabled veteran, Harold Russell. Only after researching the history of the film did I learn that the entire film crew, including Academy Award winning director William Wyler, were all veterans. This film was undoubtedly a labor of love for the director and the importance of its message was powerfully presented. The multitude of issues facing returning veterans from all conflicts is remarkably similar. In fact, this film was reissued following the Korean War to stir the conscience of our nation to provide much needed support and understanding to our returning troops. Fred Derry faces the emotional difficulties associated with men who garner respect as commanding officers in the military but are employed in menial capacities in civilian life. Derry was raised in the “poor” section of town and elevated his station in the military but was unsure how to translate this experience to a better life upon his return home. If life was not difficult enough for Derry, his wife Marie (played by Virginia Mayo) whom he met and married quickly before shipping out, expects a better life and is not supportive of her husband’s attempts to find a good job. Of course, America does not have a plan to assist Derry’s job search either (sound familiar?). Al Stephenson’s issues are different from Derry’s. He lives in what I would consider an upper middle class neighborhood and is a well-respected banking executive. He has a wife and two children but is depressed that he missed the children’s formative years as he returns to find them young adults. Although Al’s wife is clearly in love with him, Al has difficulty reestablishing intimacy after his extended absence. His boss wants him to return immediately to work and Stephenson does not feel ready. He does return to work but only after a few drinking binges. Given a promotion at the bank to provide loans to returning GIs, Stephenson must decide whether to follow the bank’s strict credit policies or offer loans to servicemen based on their character and handshake. He follows his heart and intuition at the risk of dismissal. Homer Parrish’s issues are both the most obvious and also the most complex. It is easy to understand the difficulty of a veteran who has lost limbs navigating in a world not designed for the disabled. Harold Russell displays amazing dexterity and great courage accepting this acting role and his main motivation was to demonstrate what can be accomplished through rehabilitation and determination. A little Oscar trivia – Harold Russell is the only actor to win two Academy Awards for the same role. He won the Oscar for Best Supporting Actor and also received an Honorary Award from the Academy “For bringing hope and courage to his fellow veterans through his appearance in The Best Years of Our Lives”. The more complex issues focus on the emotional impact of people staring (or avoiding eye contact) based on his physical appearance. Whether a veteran has two metal hooks attached to his arms or today’s advanced prosthetics, people’s instinctive reactions are similar. Homer must also deal with people going out of their way trying to help him with routine tasks when he really just wants to develop the personal agency to accomplish these tasks on his own. Further complicating Homer’s plight is his concern that his fiancée, Wilma Cameron (played by Cathy O’Donnell), will have her life irreparably harmed by having to tend to his physical needs, thus sacrificing her own happiness. All of these issues are real and thought-provoking. The movie does provide hope that the issues facing returning veterans can be overcome, but it emphasizes that the road is not easy. I do not want to neglect mentioning fine performances by Virginia Mayo who plays Al Stephenson’s daughter and Hoagy Carmichael as Homer’s uncle, Butch Engle, who teaches him to play chopsticks on the piano. Although this review may make you believe that The Best Years of Our Lives is a depressing film, it is not – it is an Academy Award winning screenplay that is both thought-provoking and inspirational. If you have not seen the film you should. 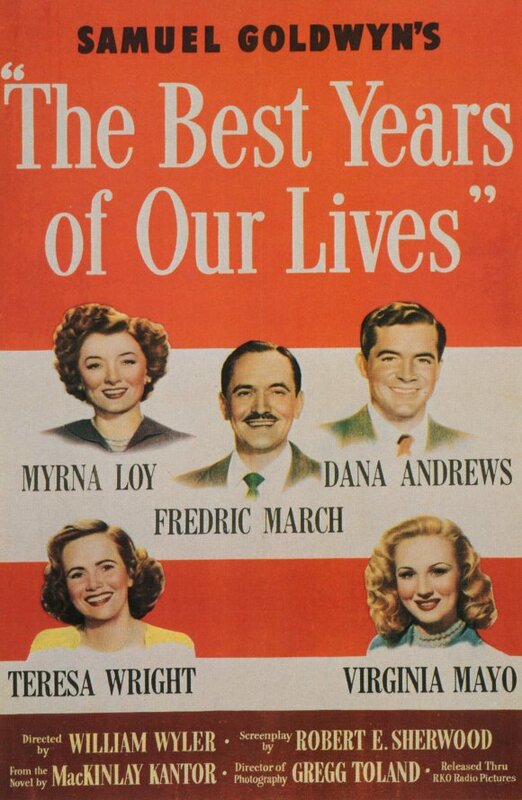 The Best Years of Our Lives was 1946’s best picture winner that had the difficult job of serving as a transition film between WWII and post-war America. The film fits perfectly into the mindset of America, as the country came to terms with one of the most devastating periods of our country’s history. The film follows the lives of three different men as they readjust to life in fictional Boone City. It is clear that the fictional nature of the city allows for more of a universal appeal for the film and American audiences. The film tackles multiple issues in the readjustment phase that are still applicable to today’s returning soldiers. It addresses everything from socioeconomic classes to post-traumatic stress disorder, as the soldiers struggle to come to terms with life in a town that has changed drastically in the five years that the soldiers have been gone. William Wyler, the director, also directed best picture winners Ben-Hur and Mrs. Miniver. While not as heavily reported on in the 1940’s and 50’s, the film shows the severe post-traumatic stress that the war placed on the psyche of these three returning heroes. It also shows the coping mechanism that the soldiers developed as they were attempting to dull their fever dreams of battle. This was a huge step for Hollywood, as it showed the bleak reality that some of these decorated soldiers had to come home too. Even with the assistance of the GI bill, many of the jobs previously occupied by soldiers had been taken when the soldiers returned. Suddenly, stripped of rank and of profession, these soldiers had the country turn its back on the men who risked their lives to protect it. William Wyler was a veteran as well, so he took a special interest in adapting this play to fit the tumultuous times of Post-WWII America. One of the three soldiers profiled, Homer Parish (Harold Russell), was actually a real veteran and amputee who William Wyler saw in a documentary. He received two Oscars for his performance, both for the best supporting actor as well as a special honor for his service to his country. After his battleship was bombed in the Pacific, Homer lost both of his hands in the aftermath. Watching him deal with the painful reality of greeting his high school sweetheart and family for the first time since his amputation is really a powerful moment in cinema. Even though he wasn’t previously an actor, Harold Russell delivered the performance of the film and really carried the entire film. The amount of dexterity he showed with his claws was really amazing as he lit cigarettes and poured drinks with seemingly blunt objects. His abilities with his primitive prosthetics were truly an inspiration to an entire generation of physically and mentally maimed men. Fred Derry (Dana Andrews) had a much different reaction to his homecoming. Before the war, Fred was a lowly soda jerk at a pharmacy in town. However, in the war Fred became a high ranking captain in the Air Force. His return to a life of the mundane after his exciting and decorated exploits in the military proved to be quite a difficult transition. While in the military Fred’s social status and position were temporarily ignored, in his return to civilian life his stripes earned in the line of duty were not enough to help improve his non-military job prospects. Fred had also married cocktail waitress Marie (Virginia Mayo) while he was in flight training, however Fred’s return to the position of soda jerk in the tough postwar economy quickly soured their relationship. Marie was not satisfied with her former pilot husband’s new occupation, and missed the wages that went along with his old position. When Fred could no longer provide for her in the way that his war status formerly permitted, it became quite clear that their marriage in the passion of war could not withstand the economic hardships faced by the limited postwar job environment. The third returning war veteran Al Stephenson (Fredric March) experienced the opposite transition of his counterpart Fred. Al did not receive the type of accolades Fred did in the war, but instead he returned to his upper middle class existence as an executive in the bank in works in. Al is older than Fred, but quite frankly his return to family life after the excitement of war leaves him feeling a type of melancholy that has few outlets in civilian life. Also, Al’s abuse of alcohol has been intensified in his time away and his new habits are having quite a negative impact on his family and personal life. His wife Milly (Myrna Loy– Also appeared in The Great Ziegfeld) and his daughter Peggy (Teresa Wright) are left trying to help him pick up the pieces of his now fragmented existence. His professional life and his status as a veteran also quickly come into conflict, as the president of his bank becomes irate after he approves a loan to another young veteran who didn’t have the required collateral to back up the loan. As the film progresses, each of our three protagonists attempt to cope with the adjustment back into civilian life in their own individual way. Fred’s marriage falls apart both due to the irreconcilable differences between himself and his wife and Fred’s blossoming infatuation with Al’s daughter, Peggy. Homer struggles with intimacy towards his girlfriend and family while learning to love himself in spite of his amputation. Al has to rely on the help of both his family and Fred as he tries to quell his night terrors from the war. This representation of post-traumatic stress disorder is very important because it highlighted an issue that wasn’t covered heavily by the media at the time. When we imagine the post-war generation that gave rise to the baby boomers, we often see a glossed over representation that doesn’t emphasize the hardships that many veterans faced returning from WWII. The Best Years of Our Lives was produced from a veteran perspective and thus was more in tune with the attitudes of returning soldiers. While we have seen movies that focus on the actual war in our journey through the best picture winners, The Best Years of Our Lives stands out because it was the first picture to accurately depict the after effects of extreme violence on the psyche of both returning soldiers and the families to which they came back.